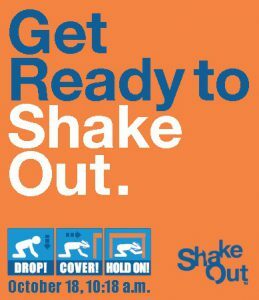 Don’t forget that tomorrow, October 18th at 10:18 AM, NOVA will participate in The Great SouthEast ShakeOut Regional Earthquake Drill. An announcement will be made on October 18th at 10:18 AM to kickoff this drill. Once the announcement is made, you should DROP, COVER, and HOLD ON! DROP down onto your hands and knees so the earthquake doesn’t knock you down. If there isn’t a table or desk near you, cover your face and head with your arms and crouch in an inside comer of the building. If getting safely to the floor to take cover won’t be possible: identify an inside comer of the room away from windows and objects that could fall on you. The Earthquake Alliance advises getting as low as possible to the floor. People who use wheelchairs or other mobility devices should lock their wheels and remain seated until the shaking stops. Protect your head and neck with your arms, a pillow, a book, or whatever is available. 10:24 An announcement will be made that the Earthquake Drill is over: “The Earthquake Drill is over, please evacuate your building.” At this time, evacuate the building and report to your assembly point. Persons with disabilities should seek assistance in evacuations. 10:40 No announcement will be made, but the Drill has officially concluded. You should re-enter your building and go back to your office or continue class as scheduled. If you are in a wheelchair: Lock your wheels and remain seated until the shaking stops and always protect your head and neck with your arms, a pillow, book, or whatever may be available. Practice your Personal Emergency Evacuation Plan during the evacuation phase of this Drill. Relocate to an Area of Assistance (if you are on a floor that does not exit directly outdoors) and wait there until the Drill is complete. Please refer to the Emergency Action Plan for more information.